This historic mine trail links significant finds of gold, iron ore, and uranium all of which played important roles in Fremont County’s history. Pick up the Gold Flakes to Yellowcake Historic Mine Trail guide at a local chamber of commerce for a map and detailed information. Start in the “Gold Flakes” region, where the gold rush hit the area just as the Wyoming territory was starting to take shape. The gold rush brought people, who formed towns and developed roads and became the first to understand the power of boom and bust cycles on mining dependent towns. Just outside South Pass City is the Carissa Mine, one of my favorite historic sites. Mine tours, which do require a reservation, take you inside the upper levels of the mine. New in the summer of 2013, working equipment has been placed back in the mine giving visitors a chance to see and hear what life was like for employees who worked with the machines that extracted gold from the ore and eventually turned it into solid bricks. From here you’ll head to Atlantic City. Surrounded by mines Atlantic City fostered a thriving community that included sawmills, blacksmith shops and of the territory’s first schools. Even with its diversification it couldn’t survive the busts and soon the town languished. Today it’s a small community where a handful of people live year round, some in modern homes and others in historic cabins. It’s one of Wyoming’s oldest cities. Consider grabbing lunch at the Atlantic City Mercantile or Miner’s Grubsteak. The ending wasn’t quite so happy for Miner’s Delight ghost town, your next stop. Miner’s Delight started as Hamilton City in 1867, but received a name change after a particularly fruitful year of mining. Miner’s Delight actually produced the greatest amount of wealth of any mining area: A 1916 report said it and nearby placers produced more than $2.5 million worth of gold, but the town remained small and isolated. Today, Miner’s Delight is a true ghost town, with original dilapidated buildings sitting as a reminder of the people who once called the place home. The next stop is the Atlantic City Project, which documents the iron ore boom and bust that started in the 1960s. In 1960 the U.S. Steel Corporation broke ground on the nation’s highest open pit iron ore mine at 8,300-feet above sea level. It was in full swing by 1963 and closed in 1984. Iron is rarely talked about when discussing Wyoming’s mineral extraction. Stop at the Sweetwater Station Rest Area to use the bathroom before beginning the “Yellowcake” region of the tour, the area home to Wyoming’s uranium mines. When you first drive into Jeffrey City, you might be confused why it has a name with the word “city” in it. But in 1953 uranium was discovered in the nearby Gas Hills. The boom transformed the area and Jeffrey City soon had a gas station and a post office. The town reached a population of 4,000, and at one point the local school had 600 students enrolled. When the uranium market busted in 1988, people got out of dodge, leaving what was once called a city, a short blip on a highway where you are forced to slow down and wonder. It’s not all as bleak as that sounds. You can get a meal and drink at the restaurant/bar and a notable potter calls Atlantic City home. It is here I feel like the boom and bust cycle hits home. This isn’t a town abandoned a century ago. This is a town that less than 30 years ago was thriving. The ghosts of this town are perhaps still alive and well and just living elsewhere. For your final stop you can see why. Gas Hills was where uranium was first discovered in September 1953. By 1955 more than 7,000 mining claims were filed in Fremont County alone. Man camps and mining towns suddenly appeared in the remote area, giving the Gas Hills Mining district a population that reached almost 3,000 people. A downturn depopulated the area in 1973 and the bust came in the 1980s. I have always believed the best way to truly understand something is to go out and see it. 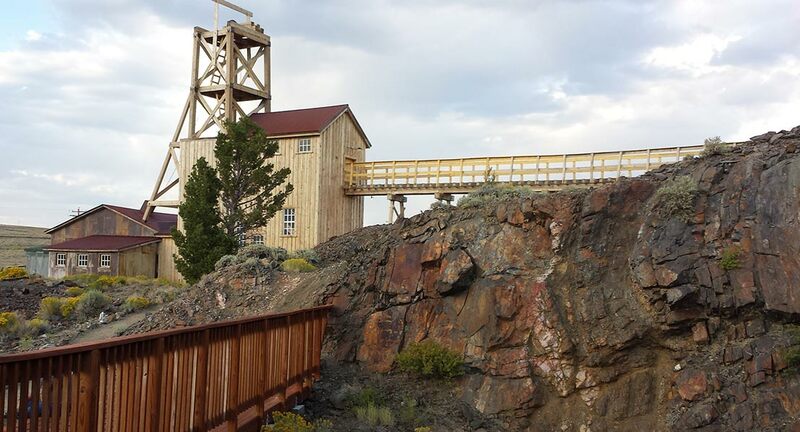 Wind River Country’s mining history is no exception. While many of the mines have long shuttered, the Gold Flakes to Yellowcake Historic Mine Trail offers a drive through history. What I love about this tour is it’s a lot of bang for your buck. 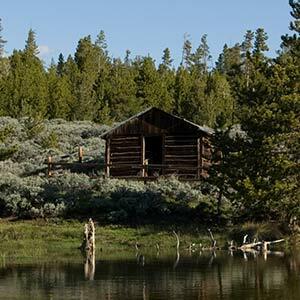 You’ll hit several of Wind River Country’s must see-sites. In 2005 the Wyoming Legislature created the Historic Mine Trail and Byway program to link historic mine locations within the state to show Wyoming’s mineral development history and its impact on Wyoming’s economy. The Gold Flakes to Yellowcake Historical Mine Trail was one of the results. When I think of Wyoming, I always think coal and then natural gas and oil. But mining in Wyoming began with gold, first discovered in the area in the 1860s. And that is where the tour begins. It’s a long day on mostly dirt roads, so pack a snack and extra water and make sure the tank is filled with gas.